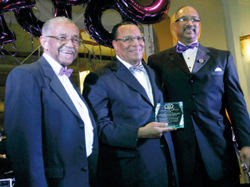 ORLAND PARK, Ill. (FinalCall.com) - The Honorable Minister Louis Farrakhan received a Lifetime Achievement Award from Omega Psi Phi Fraternity, Inc. at an elegant Black-tie dinner here November 19. The Chicago Area Omega Coalition composed of nine chapters of the fraternity covering the entire Chicago metropolitan area and its surrounding suburbs, came together to celebrate their 100-year centennial anniversary. Calling Omega Psi Phi a “great institution,” the Minister called on members of the group to be leaders in bringing all the Black Greek letter organizations together to provide business and services to those in the neighborhoods and regions in which they live. The Minister said the different Black fraternities and sororities wear Greek letters, and many members achieve much as individuals, however, more could be accomplished if they would unify. “Letters cannot of themselves make a word, and words cannot of themselves make a sentence, and sentences of themselves may make a paragraph but it takes a lot of words to tell a story,” said the Minister. While not the first Black fraternity in existence, Omega Psi Phi does hold the distinction of being the first Black fraternity founded at a historically Black college, Howard University in 1911. 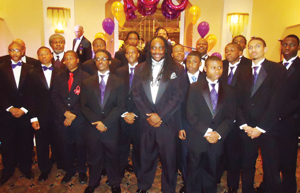 The group has more than 700 chapters nationally and internationally and counts among its ranks a long line of prominent men such as actor and radio host Steve Harvey, Dr. Charles Drew, publisher Earl Graves, actor and entertainer Bill Cosby and NBA-greats Michael Jordan and Shaquille O’Neal. 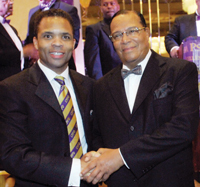 Though he has spoken about it several times, Minister Farrakhan went into detail discussing the circumstances that led to his movement towards joining Omega Psi Phi, and why he never became an actual member. “That was my first encounter with racist America personally,” said the Minister. As a freshman from the North, he said he did not like what he saw taking place in the South, and was seen as a “rebel” by many on campus. At a freshman talent show, he even performed the protest song he composed. He told those gathered that sixty years ago while a student at Winston-Salem Teachers College, he pledged Omega Psi Phi and with the legendary basketball coach Clarence “Big House” Gaines mentoring him, and made it through the first week. However, when it was time to go the next stage of the process, somebody in one of the graduate chapters spoke a negative word regarding the young student, thus preventing his entrance into the organization. Art Norman was master of ceremonies for the event. The Minister said the men of Omega Psi Phi should not be sending their children off to college only to come out begging for jobs from someone else, when the men of the fraternity could create jobs and industry with the knowledge and connections they have gained during the 100-year history of the organization. 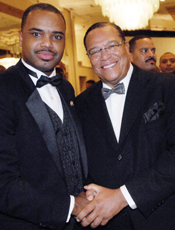 “We’ve got to grow up and stop being consumers and start being producers of what we consume,” said Minister Farrakhan. “We should walk kind of heavy on this earth because nobody paid a price like you and I paid. “For us to be standing in line looking for handouts when we built the country and made America rich, think about it! They owe us big time, but we’re not in any position to take it, but … they like seeing their face on green. America is for sale. How much of it do we own?” asked Minister Farrakhan holding up U.S. currency. The Rev. Dr. Robert Scott, who delivered the evening’s keynote address, and Min. 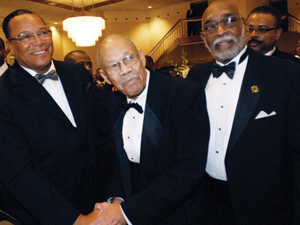 Farrakhan share a moment. Rev. Scott, who is based in St. Louis, is also the Eighth District Representative for Omega Psi Phi. Rev. Scott’s message was based on the fraternity’s motto “Friendship Is Essential to the Soul.” In a powerful way, his message focused on the true essense of friendship based on true principles of brotherhood, love, truth, selfl essness, and commitment versus relations based on what can be gained from an association called friendship. Illinois Governor Pat Quinn and Chicago Mayor Rahm Emanuel both sent letters of congratulations to the members of the fraternal organization. Unable to attend in person, the Rev. Jesse Jackson, civil rights leader and member of Omega Psi Phi, was also given a Lifetime Achievement Award, which was accepted by his son Congressman Jesse L. Jackson, Jr.
“If Jesse Jackson was standing here, yes, he would pay respect to our founders and the last one-hundred years, but Jesse Jackson would say the last one hundred years—men of Omega—is not enough, it’s the next hundred years for which we will change humankind and its destiny in this fraternity,” said Rep. Jackson. Michael J. Ward, Centennial Gala Committee Chairman, told The Final Call he was happy with the way the event turned out, and the unified display of the Chicago-area chapters of the fraternity. “I think it turned out fantastic, I think it was a great affair. It was just a great event. A perfect way to celebrate our one-hundred year centennial,” he said. Mr. Ward added that even though there is a National Pan-Hellenic Council comprised of the nine historically Black Greek letter organizations, the groups could engage in more collaborative efforts, as the Minister suggested. “We do work together, but he’s right, we do not work together as much as we should. Blacks have to learn how to empower themselves so we can get into a better situation and a better station in life,” said Mr. Ward.